Grandparents bestow upon their grandchildren the strength and wisdom that time and experience have given them. “Are you so dull?” Jesus to his disciples on realizing they’d completely missed the point of what he’d been saying. O my bloggerissimo, thank ye for speaking yer mind! That tis' the whole truth kit-and-kaboodle this blogger wants to see. And say. O my bloggerissimo. Do not be deceived. I love my grandma, tho' not the gift. If you give a very independent woman a bible for Christmas with passages underlined about how a woman should submit to her husband, you have judged people; despite that judgment, my grandma loves me very much. The weak can never think for themselves. Thinking for one's self is an attribute of the strong. O my bloggerissimo, I do love my grandma. She's very very dear to me. Tho' not the gift. 'Specially not them underlined past ages! 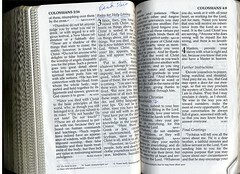 Sinseriously, Colossians 3 mocks any God that is a divinity of the good. Read it in full for yourself. O my bloggerissimo, it's quite the kicker. Seems you have deep emotional anger just from reading your writings. May the Lord bless you and keep you. May the Lord enable you to live a life of love that includes loving anger instead of unloving anger. To Him be the glory and love! Amen! It would appear that Grandma is committing the heresy of moralism in her human striving for righteousness. It appears that honesty and integrity are missing from her speech....she leaveth out much!!!!!! The deep emotional anger may well be in response to oppression disguised as a loving gesture but....then again I am not into making hasty judgments! It would appear that dear grandmother has an everlasting burden to manage others. Is she judging who is measuring up and who is not? I was under the impression that inner transformation is God's work....and not Grandmothers passion to set others straight! "It takes a great man to give sound advice tactfully, but a greater to accept it graciously." "Truth told without love is only half the truth." "We only confess our little faults to persuade people that we have no big ones." Anger indeed. And many other feelings do ensue in this here thingie called life self body baudy oddity god entity it's me. An accusation of anger, suggestive of anger as a bad, has me thinking on writing an essay about anger in poetry--a feeling squished and squimished by one Wordsworth who feared revolution would get fermenting if poets went around rowdying up the vulgate. O my bloggerissimo, "Rar!" "Raaaaaaaaaaaaaaar!" it is not irritable or resentful; it does not rejoice at wrong, but rejoices in the right. Love bears all things, believes all thing, hopes all things, endures all things. People show their love in different ways. Maybe your Grandmother feels the greatest gift she could ever give you to show you her love is the gift of God's love. Writings like this could could hurt the ones you claim to love. My grandma won't ever see the ol' blog, of that I'm purty durn sure. Now with respect to other potentially lurking loved ones, to them I'd say I ham what I ham, and to be truly loved, must be seen. Plus, here's the think--I don't believe in the Christian bible as a holy scripture. Plain and simple, there it 'tis. Any keeping on and on and on about it always makes this blogger feel less than loved really, 'specially if, as ye say, "Love does not insist on its own way". Now, bloggerissimo, don't go thinking I don't feel grateful for the fact that my grandma cared enough to send a prezzie. I truly tho' unruly do. Or that I didn't write grandma an enthusiastic thank ye note. Of course I did! So, you feel that it is okay to talk about or make fun of your grandmother (behind her back) and for others to read. Now that shows how much you truly love your grandma. You should be ashamed. Really...who in the world is this self righteous,moralizing, judgmental, pompous know it all that has assumed the role of "set ya right grandma #2? Did 'Set Ya Right' Grandma really give "the gift of God's love" in her underlined passages and enclosed pamplet? or meet her own need for righteousness? Godliness can become iniquity when reduced to law and religious legalism has been the most deadly force in human history. Judging the response to the "gift" is not doing God a favor. The greatest threat and deception is the act of appearing good and righteous which Grandma#2 is doing in carrying out her inquisition. Christians are to be known by their love not merely their theology and "Set Ya Right Grandma #2" appears to have the spirit of the AntiChrist in the righteous criticism, the superior pedantic position assumed and the LACK OF LOVE! The one who does not love does not know God. This antichrist spirit would predictably harden the heart keeping it from love. So Grandma#2 could be described as a "smokescreeen antichrist spirit". As a guest Peeper to this blog site, I must say that the first anonymous post person seems to really enjoy passing judgment on the blog owner. The blog owner was sweet enough to share an experience she had as well as speak kindly words about her G'Ma....only to be the recipient of a doo-doo storm by some indignant idiot who seems to feel he/she has all the omnipotent answers to everything. Well, say I, go back to your cave and let the blog owner keep her wonderful bright spirit and gift she has of turning a phrase. The End. I hope. Peeper. As an onlooker here to this blog site, I noticed that the nasty, judgmental, mean-spirited person who is attempting to be judge and jury to a trial only she/he is privvy to, needs to take reading lessons--specifically comprehension. The FIRST LINE IN THIS WHOLE THING STATES "If ye take offense when the Bible does receive a spanking, I ask ye to avert your eyes an think on better lines." WHAT DON'T YOU UNDERSTAND ABOUT THAT??????? Move along. You are not wanted here. I too am a peeper. Maybe the bloggerissimo is not so much talking about the bible issue as he/she is talking about how the blogger views her grandmother and makes fun of her for the world to read. I think it's ironic that this critical smokescreen AntiChrist accuses another of being emotionally angry when poison drips from her words as if overflowing from within. I cannot believe my eyes! Ha!!! Haha! Haha ha! Warning for all those reading this!!!! There be a fool and idiot reading this site and attempting to make it a pulpit from which SHE can preach!!!! This fool who is attempting this is the very same one who uses the word COWARDLY!!!!! HAAAAHHAHHAH! According to Merriam-Webster, one who is a COWARD is one who shows DISGRACEFUL fear.... Would that not descibe the very same fool who attempts to besmirch the blog writer?? I say again----GO AWAY FROM THIS SITE. YOU ARE NOT WANTED HERE AND NEITHER ARE YOUR PONTIFICATIONS! How easy it is to pass judgment when you are anonymous....BEGONE!!!! My suggestion is to let the critical person who started the pitiful chidlish name calling (cowardly??? )preach to dead air. My guess is that she is looking for a vent for her own sad little pitiful life. It doesn't matter what she says. She is looking to engage in a battle of wits and the poor thing is unarmed. Methinks she is also jealous of Heidi's incredible gift of writing as well as the fact that Heidi has such a huge following of people who admire, respect and love her. WE LOVE YOU HEIDI!!!!!! I agree! We love you Heidi! You are a gift to the word and are loved! AMEN! (teeheehee) Go back under your rock, you slithering asp and go asap! Let Heidi keep delighting us with her words without besmirching her eyes with the likes of you! I love to read what they have to say. the play the stray the jest the fest! and point the finger and proffer quotes. I love them too tho' we don't agree! Bloggerissmoes I say hail! lo! to ye. Wherever you are. Whoever ye may be. John 3:16 – God’s wondrous expression of "love". "For God so loved the world, that He gave His only begotten Son, that whosoever believeth in him should not perish, but have everlasting life." Keep those quotes a coming-for ye have posted some good ones. Keep on delighting us with ye quotes --cockroach.